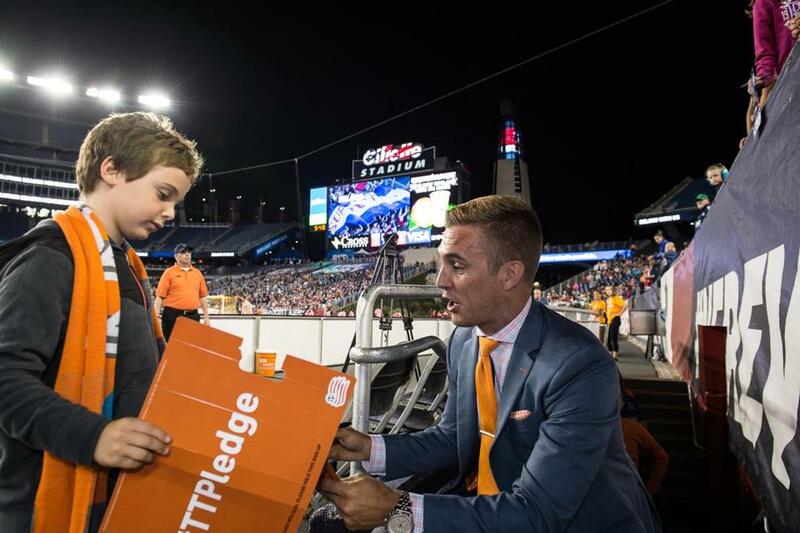 Former New England Revolution forward Taylor Twellman was honored at halftime during the Revs game at Gillette Stadium on Saturday. ESPN soccer analyst and former New England Revolution forward Taylor Twellman was at the Revs game at Gillette Stadium on Saturday for “Concussion Awareness Night.” After suffering multiple concussions throughout his career, Twellman retired from pro soccer and started ThinkTaylor, a nonprofit that is promoting “Concussion Awareness Week” from Sept. 12-16. . . . Variety recently reported that Tom Brady and Gisele Bundchen have listed their condo at One Madison tower in New York City for sale for a cool $17.25 million. The power couple are reportedly buying a new place in the Big Apple, at 70 Vestry, a luxury building in Tribeca that overlooks the Hudson River. . . . We hear that former “Saved By the Bell” star Mario Lopez from Extra TV and a group of friends dined at Nick Varano’s STRIP by Strega on Saturday night. Lopez then went over to fulfill guest-host duties at Venu nightclub along with nightlife kingpins Ace Gershfield and Jeff London.